This is a partial preview. Full document is 901 slides. View large preview. Consultasaurus PowerPoint Templates - 900+ unique editable slides with no duplication for Project Management, Reporting, Benchmarking, Analytics, Data Analysis, HR, Product Presentations, Status updates etc. Inspiration from cutting edge - finance, management consulting and product design firms. These templates can be the backbone of the creative tools needed for a wide range of presentations. 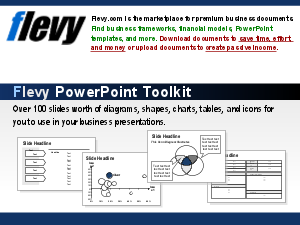 PowerPoint Diagrams Compilation? Problem Solving? Supply Chain Analysis? Or something else.